This clear plastic wine cooler by Beaumont is made from tough, durable plastic (acrylc) and will keep a single bottle of wine cool for up to 2 hours. It is designed for use in either commercial bars and restaurants or a home setting and features double wall insulation to help keep wine cool for longer. Suitable for a standard, single bottle of wine, the height of this table top wine cooler is 22.7cm with an outer diameter of 11.5cm. 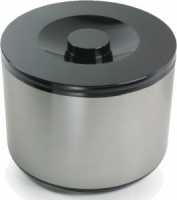 It boasts an attractive chrome rim at the top and near the base and is easy to clean. It's clear, see through plastic material means you can easily see when the bottle needs replacing. Perfect for keeping wine at the optimal temperature. Wholesale and bulk buy discounts may be available on these acrylic wine coolers subject to your required quantity. Please call us to enquire.